Looking for an arrangement of some of the best loved flowers? Forever has something for everyone's taste. 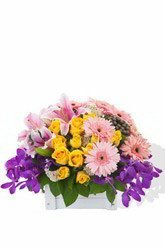 With oriental lilies, short stemmed premium roses, gorgeous gerberas and vanda, this arrangement will brighten any room. As usual my order has been delivered right on time. Good Job zFlowers.com ! easy to deal with, had to change a delivery address call the number and it was an easy fix. thanks guys! Amazing delivery - less than 3 hours! Well done.